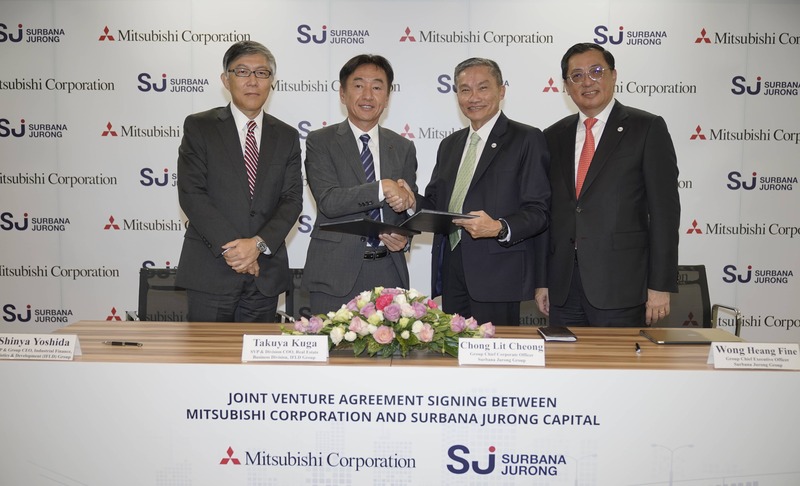 Singapore, 14 September 2018 – Surbana Jurong Capital, the newly established financial services arm of Surbana Jurong, and Mitsubishi Corporation today signed an agreement to set up a fund management company (FMC). The FMC will be a 50:50 joint venture between the two companies and will be jointly managed by both partners. According to Asian Development Bank’s (ADB) estimates, developing Asia will need to invest at least US$1.7 trillion per year in infrastructure until 2030 to maintain its growth momentum. However, there remains a huge gap between the demand for such infrastructure and the region’s access to financing. The FMC will seek out commercially-viable urban infrastructure projects which are in an advanced feasibility stage or in the early phases of construction, and provide equity investment to support such projects. Qualifying projects will need to meet sustainable environmental, social and corporate governance metrics. Institutional investors seeking to participate in the sustainable growth of the region can therefore do so through the Fund. The FMC will leverage both partners’ unique strengths to deliver optimum long-term risk-adjusted returns for the Fund. Surbana Jurong, as one of the largest Asia-based urban and infrastructure consultancies, has direct exposure to project opportunities in the region. It has over 70 years of successful project deliveries and technical teams in over 40 countries to provide insights on the risks of such projects. Mitsubishi Corporation, a global integrated business enterprise with diverse business operations, has experience in investments and financial products, and has been investing in real estate projects in ASEAN countries since 2013 totalling JPY250 billion. Surbana Jurong Capital, as the financial services arm of Surbana Jurong, will source, invest, plan, develop and manage infrastructure and real estate projects, generating long-term sustainable returns for its stakeholders. It will draw on its ability to plan and manage the risks of development stage projects, seeking to bring together existing market liquidity with appropriate opportunities, providing risk-adjusted returns for investors. Headquartered in Singapore, the Surbana Jurong Group has a global workforce of over 14,000 employees in more than 120 offices across over 40 countries in Asia, Australia, UK, the Middle East, Africa and the Americas, and an annual turnover of around S$1.5 billion. Mitsubishi Corporation’s current activities are expanding far beyond its traditional trading operations as its diverse business ranges from natural resources development to investment in retail business, infrastructure, financial products and manufacturing of industrial goods.